There are a variety of options available for sending your child to school with a tasty lunch without turning your routine upside down. Do you hear that? It is the sound of parents everywhere collectively exhaling as kids return to school. My days working from home have become eerily quiet, and the pantry and fridge are finally safe from daily raids by a bored teenager and a toddler with an appetite rivaling “The Hungry Caterpillar.” This brief celebratory moment is often followed by dread, once I realize it is time to figure out a game plan for school lunches. For kids who prefer to graze, lose the concept of a structured meal. My 4-year-old daughter is happy munching on an assortment of chopped grilled chicken or sliced salami, cheese cubes, raisins, apple slices and crackers. It is kind of like making a charcuterie board for a kid, with a juice box instead of wine. 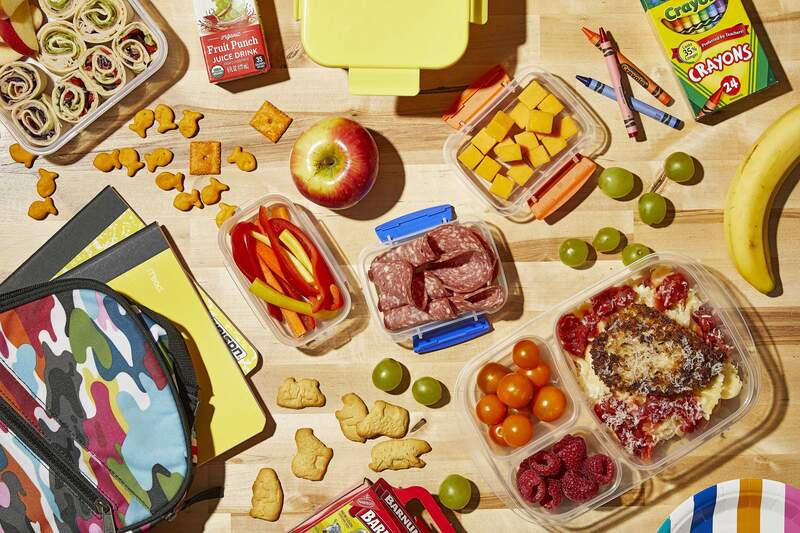 Compartmentalized plastic storage containers or Bento boxes are perfect for lunches like this.Older kids might appreciate extra protein in the form of protein bars, boiled eggs or hummus accompanied by something hearty to dip, such as pita chips and sliced veggie sticks. You can buy individual packs of hummus these days, but it is cheapest to buy a family-size container (or quickly make it from canned chickpeas) and portion it out yourself. Guacamole is another great choice for dipping, but for the sake of keeping things fresh I do think the single-serve cups can be worth the extra dollars. Last night’s leftovers can find a second home in school lunches. I am often thinking about how I will repurpose a meal for lunch before I choose to cook it for dinner, and in many cases I will cook more of it for just that reason. My daughter attends a home day care where she can have her lunch heated up, so dinner leftovers are the easiest thing to send. Some schools offer a microwave for student use; just check with your child, as they may not have time to wait in line to use it.Soups and stews can be reheated in the morning and poured into an insulated thermos to safely stay warm until lunch time. When my work involves food photography, waiting to get the perfect shot often means I miss out on piping hot meals. I have learned plenty of dishes taste perfectly fine served cold or at room temperature. Pizza and fried (or grilled) chicken is a no-brainer, and a cold meatloaf sandwich is a delicacy your children deserve to experience in their lifetime. Many pastas will work for next-day meals, too. Noodles tossed in marinara or an olive-oil based sauce are less likely to dry out. If you often have a smorgasbord of options in the fridge, consider grain or pasta bowls for your more adventurous child. Here’s how to build them:Start by filling the base of a small food storage container with cooked rice, quinoa or other grains. Other things that work are cooked noodles and small pasta shapes like couscous or orzo. Pile on some roasted veggies or raw salad ingredients such as sliced mini cucumbers, whole cherry tomatoes or diced peppers. Next, add your protein, such as shredded chicken, tuna, diced pork or rinsed canned beans. If you have them on hand, capers, pickled veggies and olives can add acidity or brininess to wake everything up. For kids who appreciate heat, add something spicy such as banana peppers or a little dollop of harissa paste. Finally, some sort of dressing will help tie everything together. If you have a favorite store-bought vinaigrette, use it! If not, it only takes a couple minutes to shake up your own vinaigrette in a Mason jar to use throughout the week. You can pack this dressing in a smaller container for your child to drizzle over the grain bowl when it is time to dig in. Sandwiches are traditional for good reason. There is no shame in packing a “regular” sandwich alongside chips, a piece of fresh fruit and a drink. (Before you reach for the peanut butter and jelly, just make sure your child’s school has not implemented a nut-free policy.) To fend off boredom, I let my children choose their favorite sliced meats and cheeses from the deli counter, and by favorites I mean whatever is on sale that week. Swapping sliced bread for pita pockets or tortilla wraps can also help break up the monotony.Do not be afraid to use leftovers here, too: Most Sunday roasts will make great sandwich meats, chilled and sliced thin or diced. Think pork loin or hams, lean roast beef and just about any form of poultry. For an easy veggie wrap, spread a large tortilla with hummus or flavored cream cheese, top with an assortment of sliced raw or (leftover) roasted veggies and roll it up. You can bulk it up with greens or cooked grains. Keep food safety in mind. Young children are especially vulnerable to foodborne illnesses, so take precautions to keep foods properly chilled (or warm) until lunch time in insulated lunch bags or thermoses. For cold lunches, include a reusable ice pack. Frozen juice boxes and squeezable yogurt tubes can also double as ice packs, which will thaw and ready to enjoy by lunch time. Visit FoodSafety.gov for tips on keeping school lunches safe.